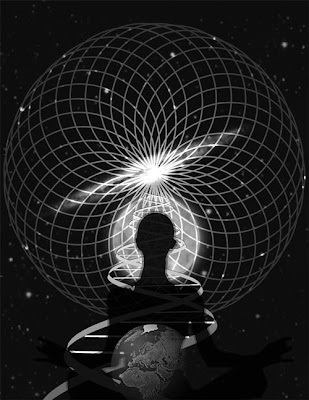 There are infinite levels of consciousness; all is consciousness. This play is infinite; the Divine is infinite; the levels are infinite. God is infinite so everything is infinite. We cannot say that there are ten levels, twenty levels: it's infinite. That's the idea. Life is a journey to the infinite. You can never say that you have already reached it, that this is the end. It is always a beginning. Time means the distance between two things. Most of the time we are in the past and when we are in the past, we create a distance. So if we want to go out from the time, we must get free of the past. Or maybe we are in the future, and then again we create a distance between the future and ourselves. We wait for the future and we don't live now, in the present. Time is now, but we create a distance: we are either in the past, or in the future. If we want to get free from time, we must get free from past and future. We have to be always in the present, with the present time in our hands. If we become servile, we lose our freedom with our way of thinking. If we don't hold on to anything, we are free. If we learn to leave, we will be free. We hold on and then we say we are not free. Learn to leave fast, never possess, get free from past and future: time will be with you and you will be fully free. It would be easier to do so by realising the value of life, of existence. We don't know the importance of our lives, and that's why we waste the present moment. We are always absent from life. We are in the past or future, with memories of the past and fears of the future. This is normal human life, the way of living: always absent from the present. The power, the joy of the present is so strong, so beautiful and big, that you will not miss your memories. Why do you invoke memories? Because you miss something and when you miss something, you open the album. The power of now, of the present is so great and full that you won't miss anything. When we live in the present our capacities grow more. Generally, we have memory of the past to enable us to remember the past. When we live in the present we do not need to rely on memory. The ultimate aim of nature's process of making the human consciousness grow is to give us the realisation, to increase our consciousness. That's the only object of life. All the rest are processes or experiments with or without love, with or without suffering. All the tools of nature are working to make humanity more conscious. Spirituality means to live with that consciousness. Everything is moving and changing but we are witnesses watching the play, not disturbing it, not interfering, just enjoying. The Self is a big word. Bring your Self to the front seat so you can direct your own movements. That's why Sri Aurobindo said: “To grow your consciousness, grow your awareness, your understanding, your knowledge. If you exist with consciousness, with good understanding, with knowledge, you are able to give direction to your movements. Then, you can tell your mind where to go.